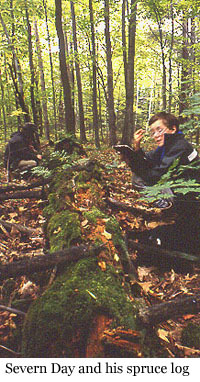 The Macoun Club launched its Study-Tree project in the autumn of 1991. Essentially all these trees are in a 10-acre hardwood forest on the west side of the Macoun Field Club’s nature-study-area in Ottawa’s western greenbelt (Stony Swamp). For 25 years, almost every Macoun member since then (and this is 2019) has chosen one or more trees, and to this day, Rob Lee knows those trees by the names of the kids who chose them. He keeps track of them, too. and this page brings you up to date. But only for trees chosen before 10 years ago, at which point those kids would now be over age 18 and it would be OK to use their full names. If you have gone back but weren’t been able to find your tree, contact Rob at macoun@ofnc.ca. Some trees were standing when chosen, and if they are still alive, even if just barely, the most recent update is in green type. The others have either died, or were dead, or even logs when chosen. Aaron Lynch’s White Birch: Chosen Nov. 22, 1992, when it had great curls of loose bark hanging down one side. It was found to be dead in the summer of 2006. Only one roll of loose bark remained, just out of reach of destructive humans. In the summer of 2014, we found that the trunk had broken 14 feet up, just above a band of bark damaged long ago by a Yellow-bellied Sapsucker. In late May, 2016, the stub still stood, but half of the bark had fallen away. Adam Ryan’s Basswood: A clump, chosen Oct. 17, 1992. In August, 2011, three of the trees were doing well and had grown to be 6, 14 and 16 inches in diameter. By the summer of 2014, two members of the clump had died and fallen down, one of them still in flower in June. It, too, was dead the following year. But in 2016, the smallest trunk and two saplings we hadn’t taken note of — 4, 5, an 6 inches in diameter — were growing vigorously. Ainsley Rich’s Sugar Maple: Chosen Oct. 21, 2006, when it was a sapling. It had some interesting scars — Rob observed that a mouse or vole had nearly girdled the base when it was just a finger-sized seedling. And in 2012, somebody whacked it with a heavy stick, crushing the delicate cambium layer in two spots. A year later two patches of bark a couople of inches across sloughed off; in 2017, the wounds were healing well with thick scars half-covering the dry wood that was exposed. Alex Murillo’s Sugar Maple: Chosen Dec. 3, 1993. It was seen to be dead — even its sprout — by June 16, 1994. It had fallen S by May 29, 1998. 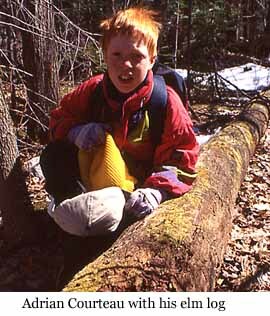 In 2011, we are unable to be sure which of several mossy logs might have been Alex’s. Alex Schlacter’s Sugar Maple: Chosen Sept. 18, 2004. We return to this 6-inch diameter tree often … to see his brother David’s sedge clump tucked up against the roots. Both were still alive in 2018. Alex Stone’s Eastern White Pine: Chosen Oct. 28, 2000, and measured at 21 inches diameter. In 2019, it remains a towering tree in vigorous health. Alex Stone’s Sugar Maple: Chosen Oct. 30, 1999. This tree took part in the region-wide flowering events of 2002 and 2006. Two of the three trunks remained healthy into the fall of 2018. The other died and fell over. Alexa Livingston’s Sugar Maple: Chosen Sept. 30, 2006. It was one of two big, healthy maples right by the central access road. The left-hand one has died, and Alexa’s looks to be not far behind — only one of the three main divisions of the trunk still lived in 2018. Alexander Wenzowski’s White Ash: Chosen Sept. 14, 1996, when the fallen trunk still arched northward over the ground. On Sept. 25, 2000, a big mass of brilliant Sulfur Shelf Mushroom had grown out of the base of the fallen trunk. Remains of the tree can still be seen in 2017. 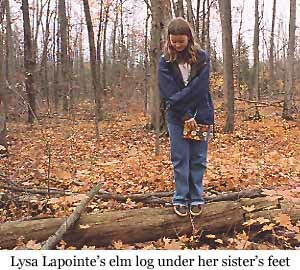 Amber Voege’s disappearing Basswood clump: Chosen on Sept. 17, 2005, when only a single, split trunk still stood out of the three or four massive ones it used to have. That last one fell down before another year had passed. In 2011, the two fairly intact logs were gradually breaking down, sagging into the low places in the ground. They were still covered with bark. In 2016, the logs have lost their form, but a 6-foot tall stub still stood. Angela Gamouras’ Red Ash: Chosen Jan. 18, 1992. This tree was outside the Study Tree woods, but being well known to us as a giant (4 ft in diamter), it was accepted. It subsequently died and collapsed under its own weight. Barbara Gaertner’s “Deep-split” Ash: Chosen Oct. 5, 1991, and named because 30 years earlier a lightning strike had split it open to the core. The lodged crown broke off from the trunk and fell to the ground shortly before Aug. 6, 1995. In 2016, fairly solid logs remained. Barbara Gaertner’s little Ash: Chosen Oct. 8, 1992. It never got to be more than knee-high, and failed to leaf out in the spring of 2006. Barbara Gaertner’s NE Sugar Maple: Chosen Oct. 30, 1991, it participated in the mass flowering event of 2002, and has remained healthy into the winter of 2019. Barbara Gaertner’s SE Sugar Maple: Chosen Dec. 20, 1991. It has fought a long back-and-forth battle with a Porcupine that has repeatedly almost girdled the tree (by growing new cambium) and with fungi that have rotted out one side of the trunk. Yet it has remained vigorous. It did not participate in the mass flowering event of 2002, but joined in that of 2006. It leafed out again in 2018. Barbara Gaertner’s Cradling Maple: Chosen Feb. 17, 1992, because it was cradling the toppling crown of her Deep-Split Ash. It was freed of that burden in 1995, and though it did not flower in the region-wide event in 2002, it did in 2006. It continued in good condition until the spring of 2011, when one of its two trunks leaned too far NE and cracked at the base. For three years, the eastern trunk took its turn being supported by its neighbour, staying alive until it fell all the way down in the spring of 2014. In 2017, the surviving trunk on the west side had a vigorous set of foliage that is carried on just one major limb and one live branch. Basswood 18*18: The crown foliage was noted to be sparse on May 27, 1993. The trunk was starting to split at the big den opening on Feb. 3, 2000. And by Sept. 5, 2001, the crown was bare and presumed dead (a man-high sprout at the base still lived). The trunk snapped off low down in 2005 and in falling, crushed it’s hope-for-the-future sprout. For a time, the hollow log was used as a winter den by a Porcupine. But even that eventually collapsed and sank down flat. Little of prominance remains. Billy’s American Elm pair: Chosen Oct. 5, 1991, when they were already dead. They fell down in opposite directions, and in 2014 persisted as big, mossy logs. Bruce Davidson’s Bitternut Hickory: A tall, slender tree chosen Oct. 5, 1991. It flourishes still, in 2019, but the branches are studded with rough balls of woody growth that we thought was the bacterial disease Crown Gall. We now believe it is instead a fungal disease caused by a member of the genus Phomopsis. Bruce Davidson’s Shared Hickory: Between a seedling and a sapling; chosen with Michael Oda on June 7, 1992. It never got to be taller than a man, and finally failed to leaf it out in 2011. It is dead. Bruce Davidson’s Sugar Maple: Chosen in October 1992. The trunk of this big tree snapped off 40 ft. up during the ice-storm of January 1998. It fell to the NW in 2010. In 2016, the log can still be identified by the big cobra canker near the base. Chantal Deguire’s White Ash: Chosen June 29, 1993 — only the newly broken-down trunk that fell north, arching as high as a man could reach. Its leaves stayed green for months. In 2016, remnants of the rotting tree can still be seen. Chris Murray’s American Elm: Already dead and broken off when chosen on Nov. 1, 1997, about 30 ft. NE of the Triple Basswood. It could still be seen in 2011, a mossy log on the forest floor. Colin Day’s Sugar Maple: Chosen Jan. 18, 1992. It had long been a landmark tree, Maple “O” (Maple “Oh”), at the SE corner of the deer exclosure. It is alive to this day, but in declining health. Not only is the upper trunk, 50 feet up, riddled with huge woodpecker holes, but almost half the crown branches have shriveled up and died in 2011. In October 2012, the crown of the tree toppled to the ground (crushing the deer exclosure). The tall stub of the trunk still stands in 2016. David Schlacter’s sedge clump: We have been watching this sedge clump, the only one ever chosen, since David chose it on Sept. 18, 2004. It has persisted these 13 years, but at the end of 2017 seemed smaller than before. Diane Kitching’s Trembling Aspen: Chosen in 1991, when it had already survived a serious Beaver attack. Although it flowered every year, it was not a good sign when we realized how sparse its foliage was on Aug. 20, 1999, with many dead limbs in the crown. Yet the final blow came suddenly, unexpectedly — lightning struck in the summer of 2005, splitting the bark all the way down the trunk! The tree lost all its leaves and seemed dead. The buds seemed to swell in 2007, but no catkins were thrust out to flutter in the wind (it had flowered every April before this). By August, sawdust was spilling out of beetle holes, and the trunk, which had been leaning more and more, was splitting in a fatal spiral. Between our October and November visits in 2006, the trunk snapped 8 feet up and fell. Measuring both parts, we determined that Diane’s tree had been 71 feet tall. The log broke into pieces, but remained sound in 2011. In 2017, the pieces retain their shape, but are crumbling with rot. Elisa Schultke’s Sugar Maple: Chosen on Sept. 18, 2004, when it was 16 inches in diameter. It was still healthy in 2017. 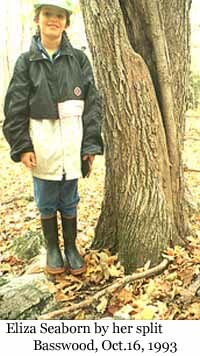 Elisa Weganast’s Sugar Maple: Chosen Sept. 14, 1996, with friend Cassia Dafoe. 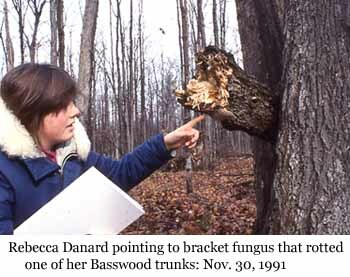 Eliza Seaborn’s Basswood: Chosen by Oct. 16, 1993, when it had already been leaning strongly for a long time, split wide open from top to bottom. It still lived, and still leaned, the upper side wide open like a rain trough, in 2017. But one side of the trunk has died, all the way up. Ellen Watt’s American Elm: Chosen Sept. 30, 2006, when it was about 8 inches in diameter. It flowered the following April, and again in 2008. It flowered again in early May, 2011. But in late May, 2012, its foliage looked half dead in the top. By July 18th, only three green leaves remained; the rest had drooped and shriveled — the signs of Dutch Elm Disease. It was dead. In 2013, the bark was coming loose and falling away. In the spring of 2014, an NCC crew cut it down so that it wouldn’t fall on anyone using the adjacent hiking and biking trail. Rob counted the annual rings: “Ellen’s Ellum” as we called it, had lived to be 50 years old. The stump and cut-up sections of the trunk are still apparent in 2016. 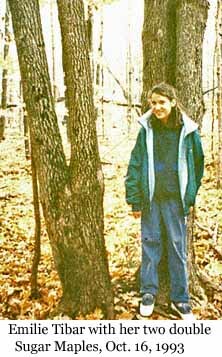 Emilie Tibar’s Sugar Maple: A “double-double in trouble-trouble,” chosen on Oct. 16, 1993. That year, a Porcupine was peeling its bark for food. The Porcupine eventually went away, and the tree recovered. One of the four trunks died back to a couple of clumps of live branches, but in 2017 the branches and the other trunks were all healthy. Francis Caron’s over-turned Sugar Maple sapling: Chosen Sept. 17, 2005, when it had been uprooted and fallen NW. It soon died, but the slender log still remains in 2017. Gabriel Levac’s Sugar Maple: This big tree was chosen on Sept. 20, 2003. It had lost half its crown in the ice storm of 1998, but recovered and was still healthy in 2016, but was found dead in 2018. Grant Savage’s American Elm: Chosen Oct. 5, 1991, when its two trunks were already barkless logs lying on the ground. Small parts of both logs still remain, much rotted down and reduced in size, in 2014. Guy Massey’s Eastern White Pine (“Pine 2”) Chosen in 1998. Right into 2018, this tree has a thick, full crown towering above the surrounding forest. Heather O’Leary’s Yellow Birch: This tree sprouted on a rotting log maybe 70 years ago. The log has crumbled, revealing some of the birch’s roots running 30 feet straight along the vanished trunk. We have a photo of this tree taken by Ernie Brodo in 1971. Heather chose it on Oct. 5, 2002. It had been growing slowly all this time, but in 2014 was still a small tree (about 6 inches in diameter). In the spring of 2016, we found that it had died. Hugo Kitching’s Sugar Maple pair (“Maple-at-the-Edge”): Chosen Oct. 12, 1992. 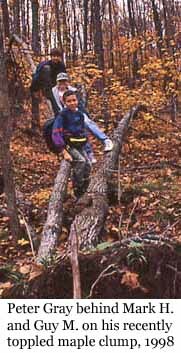 By May 27, 1993, the bigger, southern trunk was dying, its few leaves shriveling; it broke off and fell in 1996. The healthy trunk took no notice and joined in the region-wide flowering event of 2002. But its foliage shriveled up and died in the terrible drought of 2012. It died. In 2016, it stood as a tall, nearly barkless stub. Hugo Kitching’s “Holey Ash:” Chosen Nov. 23, 1991, when it was speckled with big, half-healed woodpecker holes that were connected inside. It did not flower in 2002, when other ash trees did, but it produced a heavy seed crop in 2006. On Aug. 11, 2011, a big bracket fungus was growing on the side of the trunk about 20 feet up, where we have never seen one before. The tree had a fairly full green crown on July 30, 2014, but the following spring was found dead. It had snapped off 35 feet up. A count of the very fine annual rings at the break ran to 145, so the tree might have been 180 years old. Hugo Kitching’s big White Ash: Chosen on Oct. 5, 1991. On Aug. 20, 1999, we noticed that the crown was half dead. It did not flower in 2002, when other ash trees in the forest did. On May 31, 2006, the tree was able to produce only a few tiny leaves on one small branch. By 2011, it was quite dead, with Turkey Tail Fungus covering a large part of the basal trunk. It still stood in 2014, but had fallen and broken into pieces by 2016. Hugo Kitching’s little White Ash: Chosen June 7, 1992. In 1996, a distant Sugar Maple toppled over and fell directly on this seedling tree, breaking it more than halfway down. By May 4, 2002, it was 3 feet tall again. But in 2011, we could find no trace of a small ash tree where Hugo left it. (4 m SW of Kim’s Birch — 151*255). Ian Jason-Byerley’s Bur Oak: Chosen Sept. 17, 2005, when recently cut branches lay all around the base. The tough bark of the 17-inch trunk was heavily scored by claw marks. Many autumns since then, a Porcupine has ascended and fattened itself on the nutritious acorns. It leafed out again in 2017. Jasmine Paton’s Basswood: Chosen Mar. 2, 2002, when all three trunks still stood. In the fall of 2004, the left trunk snapped off and fell.The other two were seen to be healthy in 2018. Jason Sukstorf’s White Cedar: Chosen Sept. 17, 2005, probably because the base of the trunk reclines on the ground before curving upright. It has never seemed to change in all the years since, and remains healthy into 2019. Jenna Rak’s American Beech: Chosen Nov. 9, 2002. This tree had been doing well, but in the decade since the top has broken out and only a desperate clump of short branches remain alive in 2018. But it is surrounded by a little grove of 7 healthy saplings that sprouted off the roots decades ago. Jessica Prot’s Basswood: Chosen Oct. 5, 1991 — the first person to ever choose “Basswood 18*18. It was done eventually done in by the foolish Porcupines that lived inside the hollow trunk. They ate its branches until the tree was dead. It fell over. The log has collapsed with rot. Jiliane Courteau’s smaller Sugar Maple: Chosen May 25, 1996, when it was 3/4 inch in diameter. 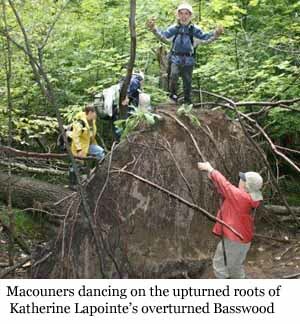 It was just far enough away from Katherine Lapointe’s Basswood to avoid being uprooted when that huge tree blew over in 2006, and in 2016 was thriving. It was then 2 1/4 inches in diameter. Jiliane Courteau’s larger Sugar Maple; Chosen with her friend Anna on Nov. 1, 1997, at which time this 15-inch-diameter tree had a double top, one part of which had cracked and half-broken in 1993. 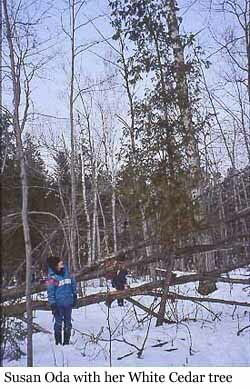 It fell E during the ice-storm of early January, 1998, nearly taking out Susan’s Cedar. In 2017, the main tree was alive and doing well, but the fallen part has broken up and rotted, and the main trunk is severely rotted and riddled with woodpecker holes. John Foster’s Sugar Maple: Chosen Nov. 30, 1991 — the well known landmark, “the Sway-based Maple.” Although it was severely attacked by a Porcupine at the very base later in the 1990s, it continues to heal over the extensive wounds and puts out a full crown of leaves every year, right into 2017. It flowered as part of the region-wide event of 2002. In September 2018, the day tornados touched down around Ottawa, powerful winds ripped half the crown out of the top. John Foster’s Rock Elm: Chosen Nov. 30, 1991. Its top broke in the ice storm of 1998, but it has carried on quite well ever since into 2018. 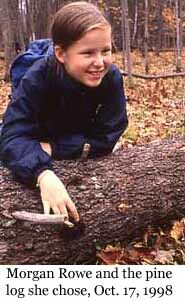 Jon Hickman’s American Elm logs: Two trunks, which fell west and south; chosen Nov. 30, 1991. They have so completely rotted away that no trace could be found of them on Aug. 11, 2011. 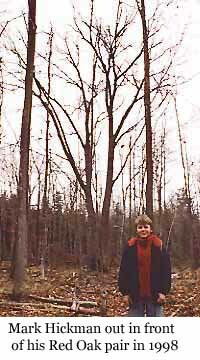 Jon Hickman’s small Sugar Maple: A man-high tree soon to be known as “Home of Bugs;” chosen June 20, 1992. Twenty-five years later, it is still a struggling, misshapen little tree, now twice the height of a man. 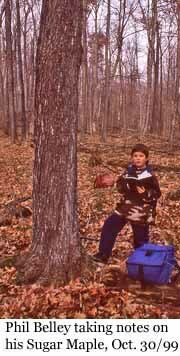 Jon Hickman’s Triple Sugar Maple: Chosen Oct. 5, 1991, when the smallest trunk was already dead. Its crown was attacked by a Porcupine in later years, but the foliage filled out so thickly that by 2005, the tangle of bare limbs in the top that the Porcupine had killed were completely hidden from view. It participated in the coordinated flowering events of 2002 and 2006. in the summer of 2018, it was still flourishing. Jonathan Swayze’s American Basswood: Chosen on Nov. 30, 1991. “Basswood 18*18” has had many owners, but Jonathan has been the only person to write it up for the Little Bear. It eventually died and fell down. It persisted as a hollow log until 2011, but in 2016 lies flat. Jordan Jason-Byerley’s American Beech: Chosen on Sept. 30, 2006, perhaps because it had an intriguing knot-hole right where a child could peer into it. The knot-hole has remained open ever since, and had some mouse-nest material spilling out of it in May, 2016. The tree is flourishing in 2018. Joshua Letourneau’s Sugar Maple: When chosen on Sept. 20, 2003, there was an empty Robin nest built onto the bulge of a large Cobra Canker on the lower trunk. It was still alive in 2014, about a foot in diameter. Julian Potvin’s “Tombstone Rock:” Chosen Nov. 14, 1998. It seems unchanged in the summer of 2016. Julien Caron’s Sugar Maple: Chosen Jan. 10, 2006 at ths same time his twin, Patrick, chose its twin immediately to the south. These two trees, side by side, have flourished ever since. But like the boys, these are fraternal twins, for this one always turns colour a little before the other. They were both doing fine in 2016. Julien Quesnel’s White Birch: Chosen Sept. 17, 2005, when it was 9 inches in diameter. It had lost most of its top in the ice storm of 1998, but had recovered and continues to do well in the fall of 2017. Karl Grenke’s Leatherwoods: Chosen Mar. 10, 1993. Seven of them, in a line, right beside his Study oaks. The barely perceived beginning of the end came in the winter of 1996, when deer first browsed their delicate twigs. By the end of the winter of 2001, we could only find six, and one in the middle was in an enfeebled state, from browsing by the expanding deer population. On July 24, 2004, we saw that the middle three stems had been browsed until they were just bare sticks. In 2004, only 2 or 3 of the original 7 were left alive. In 2006, none of them showed any sign of life. Now, no trace of them remains. Karl Grenke’s American Elm: Already a bark-covered log when chosen on Nov. 30, 1991. Karl Grenke’s Red Oak pair: Chosen Oct. 5, 1991. Both died, and by 2011, the northern trunk had fallen over. Karl Grenke’s big Sugar Maple: The famous landmark tree, “Maple Cross.” In August 1999, we noticed dead limbs raggedly poking up out of its crown. By May 21, 2001, it was dead except for some man-high sprouts off the root collar. It fell south in the late summer of 2003, and no trace of it can be found in 2014. 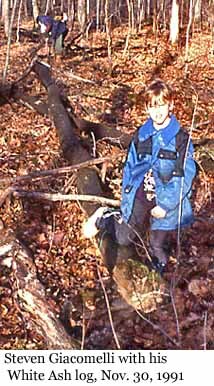 Karl Grenke’s little Sugar Maple: This small tree, entwined with a much larger White Pine, had fallen down, dead, by Sept. 25, 2000. Pieces of it could still be seen at the foot of the pine, but that tree has died, too (in 2014). Katherine Kitching’s American Beech: Chosen Oct. 5, 1991, when it was 10 inches in diameter. It had already survived the lightning strike that killed the adjacent tree (an ash) just two feet away, and barely escaped being crushed when the dead top fell out of Nic’s massive Aspen in September, 2008. Branches torn off in that event showed that the tree was producing nuts. It thrives to this day, in the spring of 2018. Katherine Kitching’s triple Basswood: Chosen in 1991, this trio did well until Oct. 24, 2004, when she discovered that the southern-most trunk had snapped off 15 feet up — live — and fell flat. It had been hollow for a long time. The other two trunks continue to do well in the spring of 2018. Katherine Kitching’s Red Oak: Chosen Oct. 12, 1992. It is still the very biggest living oak tree around in 2018. Katherine Kitching’s double Sugar Maple: Chosen Jan. 18, 1992, and seldom observed with certainty after that because of a look-alike pair close by. But in 2006 we sorted it out — all to no avail. The tree had long been dead and stood barkless; one trunk was a short stub. Katherine Kitching’s White Ash: A half-uprooted tree when chosen on Nov. 23, 1991. It eventually sank to the ground, knocking over its long-time supporting tree in the process. It had just about rotted away as of 2014, but mossy green chunks were still visible, rotted red inside. Katherine Lapointe’s Basswood: Chosen Sept. 19, 1998. This perhaps too tall and too vigorous tree blew over before a very unusual easterly gale in late December, 2006, but, lying flat, leafed out in the spring of 2007 and 2008. It then died, but in 2011 remained a complete tree. An elderberry bush was growing out of the mass of earth still held by the upturned roots. It was still a substantial log in 2014. Katherine Lapointe’s Butternut: Already in very poor health when chosen on Dec. 12, 1998, this tree soon died and fell over. In 2011 we could still see it as a log, but in 2016 it takes an experienced eye to trace out the pattern of rotten wood fragments. 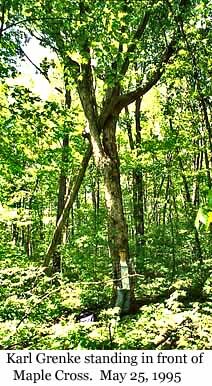 Kathleen Burke’s Sugar Maple: This tree was long dead and flat on the forest floor on Sept. 18, 2004, when Kathleen chose it. It wasn’t rotting anymore because a protective black coating of the fungus Ustilina vulgaris had formed over the whole thing. It is still like that in 2014. Kathleen Watt’s Eastern White Spruce: Chosen Apr. 29, 2000 when it was about 8 years old and 15 inches high. Only 12 ft SSW of Diane’s towering Aspen, it narrowly escaped being crushed when that tree crashed to the ground in November, 2006. On Aug. 11, 2011, we measured it height at 41 inches. Then the drought of 2012 nearly killed it. All the needles fell off, except for three scraggly branches down at the bottom. In 2014, vertical sprouts started up from the uppermost branch, 8 inches above the ground. In May of 2016, it was hanging on, putting out new bunches of needles at the branch tips. But in the fall of 2017, we found it dead. Katy van der Linden’s Sugar Maple: Chosen Nov. 14, 1998, this tree remains a dominant member of the forest canopy. (The “Sway-based” maple.) It is still in good health in 2018. Kery Christove’s Sugar Maple stub (known as “canker lump”): Chosen with Jordan Ludington on Oct. 5, 1991. Fallen over by Nov. 22, 1992. Soon no trace of it could be found. Kim Sayer’s White Birch: Chosen in May of 1995. It was badly torn up in the ice-storm of January, 1998, being left with just two major limbs. On Sept. 5, 2001, we noted that the crown leaves were shriveled and brown, and the epicormic shoots were bare. Was it dead? By 2006, all the limbs had fallen. The whole trunk, tottering on an unstable base, stands yet in the winter of 2018. Kyle Bentley’s Sugar Maple pair: Chosen Oct. 30, 1999, at which time it had a dead elm lodged between the two trunks. On Aug. 21, 2006, a big clump of Dryad Saddle bracket fungus sprouted out of one trunk; two years later (January, 2008) that trunk snapped off at that same point and fell down. The fungus continued to sprout from the break into late May, 2008. 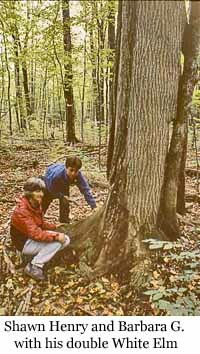 The other trunk remains healthy; although it did not flower in 2002, when almost every other Sugar Maple did, in 2006, it flowered as part of that year’s widespread flowering event. It remained healthy, with the fallen trunk still being held up by its intact base in 2014. But in May, 2016, it was found dead; the fallen trunk lies on the ground. The fungus, however, was flourishing. 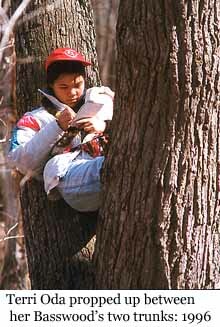 Lauren van Ingen’s Red Oak: A double-trunked tree in the N, chosen Sept. 19, 1998. 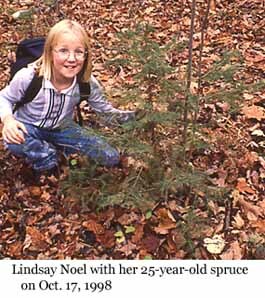 Lindsay Noel’s Eastern White Spruce: Chosen Nov. 1, 1997, this 2-foot high spruce was 10 ft. SE of Susan’s Cedar. Only a beaver-cut stump remains after the animal made off with it in 2010. 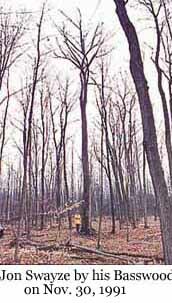 Liz Oakham’s White Ash: Chosen Oct. 14, 1995, when it was just 4 feet tall. After a few years, it was smashed to the ground by a big maple, and put out a bunch of suckers from the root collar. But the trunk survived, tipped over at a low angle, and the basal shoots died. The new growth has curved up into the air; in 2011, the stem was 15 feet long, but only 10 feet high. The leaves seemed small; it was still struggling. Lorin Gaertner’s White Ash: Chosen Oct. 5, 1991. Although it did not flower in 2002, when other ash trees were, it appeared to be doing well until late September, 2005, when a windstorm tore the tree apart. At the foot of a towering splinter of a trunk lay the rest of the tree, still green with leaves. It died. There was a geocache box inside a cavity in the 30-foot-tall standing part in 2016. 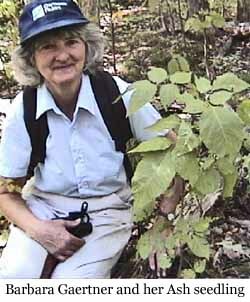 Lucy Montgomery’s Red Oak: A seedling with four leaves, chosen Sept. 26, 1992. Within a few years it disappeared. Luke Porter’s Silver Maple: Chosen on Sept. 30, 2006. This is the only Silver Maple within the Study Tree Woods proper, though there is a whole forest of Red and Silver Maples in the adjacent seasonal wetland. True, it is in a wet place very close to the border. It’s a tall, healthy tree, right into 2018. Lysa Lapointe’s White Elm: Already dead and barkless when chosen on October 5, 1991, this 14-inch diameter tree toppled to the SW in August, 1996. About 10 feet of the trunk persists as a mossy log in 2011; the rest has disappeared through rot. 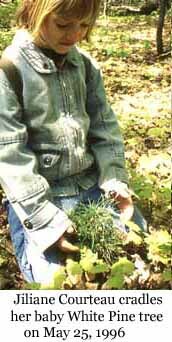 Lysa Lapointe’s Wild Leeks: Chosen Oct. 5, 1991, when they were just bulbs buried in the leaf litter. Leeks still come up there every year, but of course we have never been sure exactly which Leeks were Lysa’s Leeks. 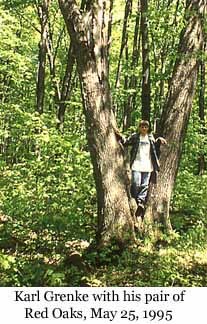 Madelein Poirier’s disappearing Basswood clump: Chosen on Sept. 17, 2005, when only a single, split trunk still stood out of the three or four massive ones it used to have. That last one fell down before another year had passed. In 2011, the two fairly intact logs were gradually breaking down, sagging into the low places in the ground. They were still covered with bark. In 2016, the logs have lost their form, but a 6-foot tall stub still stands. 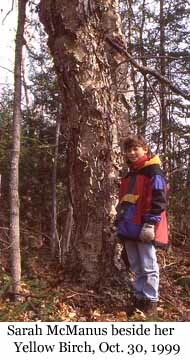 Margaret Burke’s White Birch: Already a log, recently fallen into the swamp, when chosen in 1996 or 1997. In 2018, it persists as a white tube of bark with soft and sinking insides. Mark Hickman’s Red Oak pair. This tree is heavily pruned every September by Porcupines fattening up on acorns, but it vigorously puts out new foliage ever year, right into 2018. Mark Hickman’s Sugar Maple: Chosen as a pre-Junior on Apr 29, 1993, because a ravenous Porcupine was stripping the crown branches of buds. It survived that, and has been vigorous ever since, flowering in 2002 and 2006, and flourishing into the fall of 2018. Mark Oudin’s Red Oak: One part of the deeply split trunk fell on or before July 20, 1998 and lies on the ground, little changed except that the bark has fallen off, and moss is starting to grow in small patches. The rest of the tree remains vigorous, right into the summer of 2017. Mark Woodley’s Basswood: Chosen Oct. 14, 1995 — the famous “Basswood 18*18.” Years later it died and fell down. Little remains. Matthew Godsoe’s White Birch pair: Chosen Sept. 26, 1992, both trunks led pretty much normal lives until 2014. Then, the NW member died, and the other one had only tiny leaves up top. In 2015, both stood dead, but a thicket of epicormic shoots sprang up at the base. In May, 2016, all parts were clearly dead, and the treetops had lost their fine twigs. Matthieu Oudin’s American Elm: A double tree, already long dead when he chose it on Mar. 14, 1998, because a Hairy Woodpecker was drilling holes into the side of this dead tree. By July 20, both trunks had fallen, one N past Lorin’s Ash, one part S. Both logs are fairly intact on the forest floor in 2014. 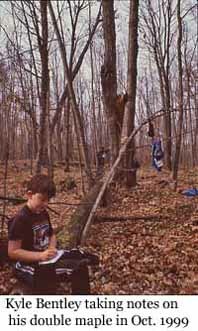 Matthew Schlacter’s Sugar Maples: Matthew chose two 5-inch-tall seedlings on Sept. 18, 2004, at the end of Kathleen Burke’s log. Deer ate them both the next year. Michael Berg’s American Beech: Chosen Nov. 30, 1991. It developed some kind of disease in the trunk, resulting in the bark starting to fall off the south side, and woodpeckers to drill holes about 10 feet up in 2006. Nonetheless, it put out good foliage every year, right into 2016. That year a Pileated Woodpecker made a nest hole and in late May was incubating eggs. In 2018 it looked unwell. 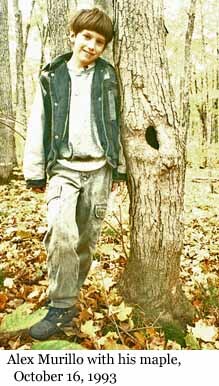 Michael Oda’s Bitternut Hickory: A famous landmark when chosen on Nov. 23, 1991, it seemed healthy but the hollow trunk buckled a year later. It was found fallen on Sept. 24, 1992. It lived for a time, flowered, and produced nuts. It was still green on Oct. 10, 1993, but soon died. Only a few uncertain traces of rotted wood remained in 2016. Michael Oda’s Sugar Maple: Chosen Oct. 5, 1991, just 15 feet from his friend, Hugo’s, big Ash tree. It took part in the species’ mass flowering events of 2002 and 2006. To all appearances, it leads an uneventful life, right into 2018. Mikheila Poitevin’s Sugar Maple: Chosen on Sept. 18, 2004, this medium-sized tree still lived 13 years later, in 2017. Morgan Rowe’s Eastern White Pine (“Pine 1”): Chosen 10 months after it had fallen down, on Oct. 17, 1998. The tree had been weakened by Carpenter Ants that got in where a Porcupine had chewed away the bark about 8 feet up, and by a Pileated Woodpecker that drilled a big hole to remove them, but it took the ice-storm of January 1998 to bring it down. Both barkless stub and log remain as part of the forest scene in 2018. 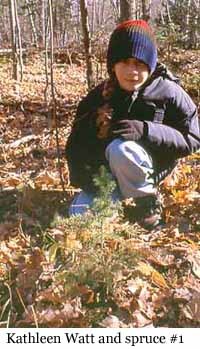 Morgan Rowe’s Spruce: Chosen Nov. 1, 1997, this 32-inch-high spruce was about 8 ft. SW of Susan’s Cedar. It was cut down by a Beaver in 2010; in 2011 only a short little stump remains, with Beaver tooth-marks. Nathan Jubb’s spruce: Chosen Nov. 1, 1997, this 24-inch-tall Eastern White Spruce was 8 ft. S of Susan’s Cedar – the most southerly of a group of four little spruces. All of them were cut down and taken away by a Beaver in 2010. Only the little stump remains. Natasha Sim’s Balsam Fir: Chosen on Sept. 15, 2001. This tree never got any taller than 2 inches! But it persevered, until a passing deer nibbled it bare in the winter of 2008. It never put out another needle after that. In 2011, not a trace of it could be found. Nathan Jason-Byerley’s White Cedar: Chosen Sept. 30, 2006. It has always been a healthy tree, even if all the limbs on the lower half of the trunk have died for lack of sunlight in the thickness of the forest. For years it sported a baseball-sized burl on a pencil-thin root exposed at the soil surface. It still looks healthy in the winter of 2018. Nathan Jason-Byerley’s White Pine: Chosen just after its violent death, on July 6, 2006. The tree had been struck by lightning and great splinters 10 and 15 feet long had been blasted out of the trunk; they lay here and there for 40 feet around. The top lay on the ground below the gaping stub of a trunk, its needles wilting. All the parts were still visible 10 years later, in 2016. Nell Letourneau’s White Ash: This small tree (7 inches in diameter) got bent over to the ground in the ice storm of 1998. It sprang back halfway when the ice melted, but remained curved over to the horizontal. 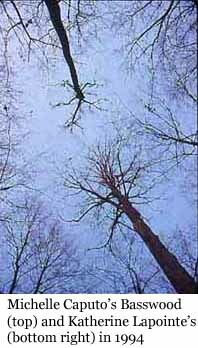 When Nell chose it, on Sept. 20, 2003, small branches on the upper side were growing straight up. In 2016, they formed a row of “saplings” 25 feet up in the air. Nicholas Jorre de St. Jorre’s Sugar Maple: Chosen Sept. 30, 2006. It was just a sapling, but had been uprooted and lay, still alive, on its side. It subsequently died, but 10 years later can still be seen, a barkless log supported off the ground. Nick Lapointe’s Large-toothed Aspen: Chosen Oct. 5, 1991. Some dead branches were noted on May 8, 1999. Yet it flowered every April until 2006; the catkins waved in the wind one last time. Leaves came out on only part of the tree, life retreated to a single branch, and finally the last leaves shriveled and turned brown in August, 2006. At the same time, wood-boring beetles began spilling sawdust out of holes in the trunk. The crown of the tree fell to earth in September of 2008, leaving a tall snag. From 2006 until 2011 a neighbouring tree was leaning hard against the upper trunk, but it is proved to be a sturdy tree and outlasted its trouble; it stood free again in 2012 and remains so in 2018. But most of the trunk has lost its bark. 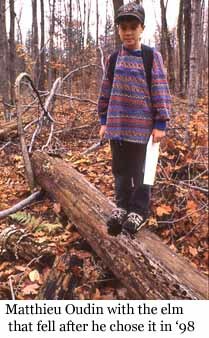 Nick Lapointe’s little aspen: A remote sucker off the roots of his big tree; chosen June 20, 1992. Like all the other root sprouts (Solange’s, William’s) it soon shriveled up and disappeared. Nicky Mawson’s Raspberry cane: Chosen on Sept. 18, 2004. The following year, a White-tailed Deer nibbled off all its leaves. It died. Noah Porter’s American Beech: Chosen on Sept. 30, 2006, perhaps because it had an intriguing knot-hole right where a child could peer into it. The knot-hole has remained open ever since, and had some mouse-nest material spilling out of it in May, 2016. The tree is flourishing into 2018. Pascal Lussier’s Basswoods: Chosen Oct. 23, 1992. Four trunks — two upright, and two leaning far east and west. By 2006, only one trunk remained standing, and in 2014 it still bore a healthy crown of leaves. By 2016, however, almost half of the big crown limbs had died. Pascal Lussier’s Sugar Maple: Chosen Oct. 17, 1992. Two double trunks, the NW member falling so as to lie between the others on or about Aug. 1, 1995; two others collapsing by Aug, 9, 1999. One trunk left alive. 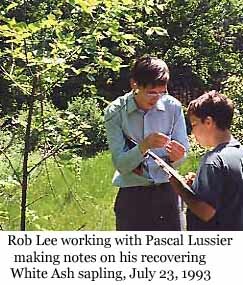 Pascal Lussier’s White Ash sapling: Chosen on Oct. 17, 1992, when it was as tall as a man. On May 10, 1993, we noticed that its lead shoot was dead; side branches from one year back would have to become the new trunk. They began that process, but on July 23, 1993 we found that someone had reached up and broken off the top 2 1/2 feet; the tree would have to start over. It did, and its first flowers, seen May 8, 1999, showed it to be a female tree. The branches were laden with seeds in 2007, 2009, 2011, and 2013. It gets bigger every year, and in 2012 it stayed green when all around it were shriveling up in the drought. But its days must be numbered, for in 2013 woodpeckers discovered Emerald Ash Borer larvae under the bark. It foliage was still healthy looking in 2014, but the leaves were small and yellowish in 2015. In May, 2016, it was dead, its bark riddled from top to bottom with Emerald Ash Borer tunnels. Patrick Caron’s Sugar Maple: Chosen Jan. 10, 2006 at ths same time his twin, Julian, chose its twin immediately to the north. These two trees, side by side, have flourished ever since. But like the boys, these are fraternal twins, for one (Julien’s) always turns colour a little before the other. They’re both doing fine in 2018. 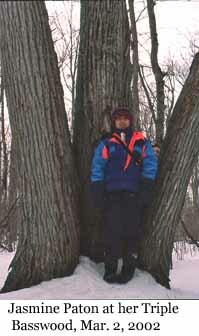 Peter Gray’s lodged Sugar Maple clump: Chosen in the fall of 1998. It slowly rotted and settled to the ground. 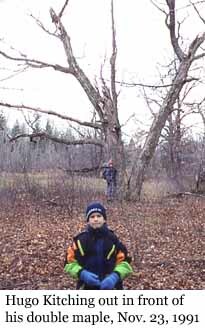 Peter Gray’s lone lodged Sugar Maple: Chosen Nov. 14, 1998, 10 ft. N of the clump. 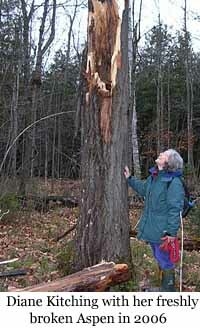 Peter Griggs’ White Ash: Chosen Nov. 18, 2006, when this tree had already been reduced to a stark splinter 25 feet tall. It stands still, in 2016. Philippe Belley’s Sugar Maple: Chosen Oct. 30, 1999, this tree flowered in 2002 and 2006, and it has remained healthy into the spring of 2018. Rebecca Danard’s Basswood pair: Chosen Oct. 5, 1991. The N member of the pair, a dead stub, had fallen as of Sept. 25, 2000. The other fell in November, 2006. Both logs are still evident in 2016. Rebecca Danard’s Striped Maples: Chosen Oct. 23, 1992. They were measured and studied, and one by one died of some fungal disease affecting the trunks. We think the species no longer exists in the Study Area. Rebecca Danard’s Study Pool: Chosen by June 11, 1993, when water filled the hollow left by Solange’s big Ash tree being uprooted. It will probably last for hundreds of years. Rob Lee’s leaning Hop Hornbeam: Chosen Oct. 28, 1991. Though leafless, he thought it was alive because it had buds. But they never leafed out the following spring. It toppled on Sept. 23, or 24, 1992. Rob counted the exposed annual rings and got 80 years. By 2002, the bottom 10 feet of the log had rotted away. Rob Lee’s Hop Hornbeam sapling: Chosen Oct. 30, 1991, because it had a paper-wasp nest on one slender branch. It is an elusive tree, easily blending in with the background of other Hop Hornbeam saplings, so we know little about it. Rob Lee’s resprouting Hop Hornbeam: First noted in 1988, when a deer raked its antlers up and down the trunk so vigorously that it killed the upper part of the tree, which had been as tall as a man could reach. A bud at the base sprouted and by 2010 had grown to be taller than the original. But a new buck has also grown up, and the side of the new sapling has been scarred again. The wounds were minor, however, so the tree continues to thrive and grow well into 2018. However, several basal sprouts had popped up in May, 2016. Rob Lee’s tallest Hop Hornbeam: Chosen Oct. 19, 1991. He made a measurement suggesting it was 62 feet tall. It continues to live an unremarkable life, right into the summer of 2017. Rob Lee’s 19 Sugar Maple seedlings: All within 1 square foot, chosen July 23, 1993, when just a few months old. They did well through the rest of the 1990s, but by then the expanding deer population was scouring the woods for food and ate their leaves. In 2001, only 4 were left alive; in 2005, three. Only one remained alive in 2006, with a single leaf no bigger than a thumbnail. By August, this last survivor was dead. Robbie Stewart’s Sugar Maple: This sapling looks like a sprout on the side of a bigger tree, inside the experimental deer exclosure fence. Robbie chose it on Nov. 6, 2004. It survived the drought of 2012, and was as healthy as any other in July, 2014. And just like every other maple, its leaves were speckled with tiny holes eaten by a microfungus. It leafed out again in 2016. but in 2017 only a small side branch remained alive. Sarah Boni’s big Red Oak: Chosen Jan. 18, 1992. By Sept. 6, 1993, the big western limb was dead. It was sagging, but still up on Sept. 25, 2000. In 2011, the trunk lay bare and dry and solid beside a new, unauthorized trail that has developed. In 2016, the log, still dry and hard, was breaking up. 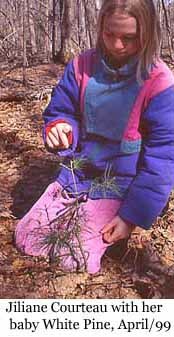 Sarah Boni’s White Pine seedling: Chosen May 2, 1992. On Aug. 20, 1999, we noticed that it’s foliage must have been completely browsed because there was just one clump of needles on a new sprout halfway up the tiny stem. The sprout flourished that year, but it has never been seen again. Sara Potvin’s Butternut: Chosen on Sept. 21, 2002, this tree subsequently died of Butternut Canker Disease. The fungus had killed all but three thin threads of life-sustaining bark at the root collar by 2009, but in August 2011, two of the three divisions of the crown were still living. By 2014, it was dead, and in 2016 had tipped over into another tree, the roots having rotted out. Sarah McManus’ Yellow Birch: Chosen Oct. 30, 1999. We observed that it looks as if it lost half of its limbs in the ice-storm of 1998. Otherwise, it has remained in good health right into the summer of 2018. Scott Nelm’s Sugar Maple: Chosen Oct. 5, 1991. Nine limbs — half the crown — were torn out by the ice-storm of January 1998. Yet it joined in the mass flowering event of 2002, and remained a vigorous part of the forest canopy in 2016. But in May 2017 it was seen to be dead. Severn Day’s Eastern White Spruce: Chosen Sept. 26, 1992, when it was a mossy, well-rotted nurse log with baby cedars sprouting out of it. It was rich reddish brown inside and in a delicate state of decay when passing humans discovered it and kicked it all to pieces for fun. Shawn Kiselius’ Sugar Maple: Chosen Sept. 17, 1994 — a tree whose top had recently broken off 40 feet up and, falling, knocked the Two-faced Maple askew. Both the fallen top and the 40-foot snag (which fell in the other direction) could still be seen in 2011; in 2016, only the log. Simon Dewalt’s Sugar Maple: Chosen on Sept. 18, 2004, this 14-inch diameter tree still thrives in 2017. Solange Courteau’s big Trembling Aspen: Chosen Jan. 18, 1992, when (already dead from a beaver attack) it fell eastward, taking another aspen with it. Both got hung up for years in still other trees. The dead top had started to fall down by Dec. 3, 1993. In 2011, the trunk is red with rot and green with moss; the stump is hidden by sedges growing over the top. Solange Courteau’s little aspen: Chosen June 20, 1992, it died back to a basal sprout by July 23, 1993. The sprout’s leaves were still green on Oct. 10th of that year. It was completely dead by Sept. 5, 1994. Solange Courteau’s White Ash: Chosen Jan. 18, 1992; a big tree that had been uprooted in 1988 and fallen into the Woodland Pond’s floodplain. It died and after many years, the upturned roots rotted away. In 2011 the soil lifted by those roots had formed a tree-throw mound, and the log wass much rotted. In 2015, it broke in two near the base. Stefan Gingras’ Sugar Maple: Chosen Oct. 5, 1991, when it was 14 inches in diameter. It was in good health, except that every years since 1989 a Porcupine had chewed away another section of bark at the base. By 1992 it had gone all the way around, and the tree had been girdled. For several years it continued to put out leaves, but more weakly every time. It was still alive in June 1995, but dead before autumn. Fallen by Oct. 7, 2003. Steph (Estafania) Ayala’s Eastern White Spruce: Chosen May 2, 1992. It is thriving to this day, in 2018, but the very tip has died. Stephanie Johnson’s Sugar Maple sapling: Chosen Nov. 1, 1997, this small double tree was immediately east of Jiliane’s. We could not find any trace of it on Aug. 11, 2011. 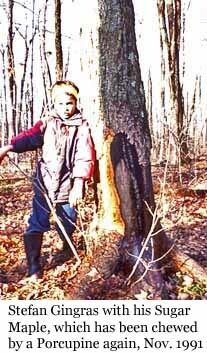 Steven Giacomelli’s Sugar Maple: Chosen shortly before being knocked flat (KO’d) on Sept. 24, 1992. It maintained some root connections and was still green on Oct. 10, 1993, and was even leafing out again on May 20, 1994. But the leaves were limp and drooping by June 3, 1994. In 2011, the main indication that it ever existed is the small mound of earth heaved up when it got pushed over. Steven Giacomelli’s White Ash: Chosen Nov. 30, 1991, when it was a barkless log suspended two feet off the ground. Steven Watt’s Eastern White Spruce: Chosen Apr. 29, 2000, when it was 39 years old (by counting branch whorls). Though its growth is suppressed by the shade it lives in, it maintained its thick foliage into 2014. But in 2016, the whole tree looked a little thin. Susan Oda’s Eastern White Cedar: This tree narrowly escaped getting crushed in 1998, when the top of Jiliane’s maple fell across it. Being an evergreen, we can always see that it is alive, right into 2018. Sudan Oda’s Leatherwood pair: Suffering from wintertime deer browsing, the E member of the pair was literally falling apart on Sept. 25, 2000. By May 21, 2001, the old stems Susan had originally chosen were dead, but new sprouts were coming up from the ground. On Sept. 22, 2004, the sprouts, now 30 inches tall, had been browsed so severely they were just sticks with tufts of leaves at the top. They continued to sprout right into 2006. No trace of them remained in 2011. Terri Oda’s Basswood clump: She says she “met up with” this set of trees in 1996, when one of the three trunks had already fallen to the south. On Apr. 26, 1997, she found that the second had also tipped over, being supported for a further year or two by a neighbour. The last trunk fell NW in the summer of 2003. In 2011, the two fairly intact logs were gradually breaking down, sagging into the low places in the ground. They were still covered with bark. In 2016, the logs have lost their form, but a 6-foot tall stub still stands. Terri Oda’s Leatherwood: Chosen in 1991, the several stems all “committed slow suicide” and progressively shed their limbs. Sprouts kept coming up until 2006. For several years, no trace of them was seen, but in 2015 one popped up. In the spring of 2017, it looks healthy. 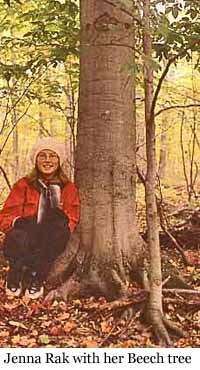 Terri Oda’s Hop Hornbeam: Chosen Oct. 5, 1991, when she measured it at 121 cm tall By the spring of 1996, it was 221 centimetres! Rob measured it again on Aug. 11, 2011: it was 587 cm tall. It is growing slowly taller, right into 2018. Terri Oda’s Sugar Maple: Already “dead on its feet” when she chose it Oct. 5, 1991, the rot-softened trunk had toppled by the end of the month. The trunk split spirally and was sagging to the ground by Sept. 5, 1994; on Apr. 27, 2002 only the upper part of the tree remained. The main trunk had completely rotted away, and the stump was gone, leaving a star-shaped hole in the ground. 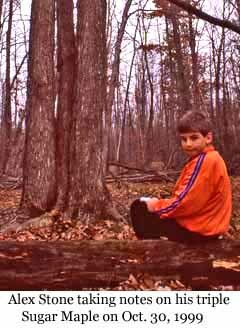 Tyler Park’s Sugar Maple: A long-dead stub chosen Oct. 14, 1995, upon seeing a Deer Mouse looking out of a hole at him. Within a few years it fell over. William Godsoe’s Large-Toothed Aspen: Chosen Sept. 26, 1992. It turned out to be a remote sprout off the root of Nic Lapointe’s tree. It died in 1996 without ever getting much bigger. Willow Johnson’s White Birch: Chosen Sept. 17, 2005, when the ground at its feet was littered with freshly cut birch branches — branches cut and dropped by a Porcupine. It has done well all the years since, into 2018. All photos donated or provided by members and leaders, past and present. Updated June 13, 2016.